Last year's reform drive of the nation's highest tax administration will even be expedited with much relaxed tax audit policies on foreign tax payers as well as local ones this year according to the recently announced directions of National Tax Service's tax audit policy. Last year, the National Tax Service (NTS), headed by its Commissioner Yong-Sup Lee, announced "2003 Tax Audit Policy Directions" for both local and foreign corporate taxpayers and individual taxpayers on July 1, 2003 and July 23, 2003, respectively as parts of its reform to reduce unnecessary troubles taxpayers so far went through. 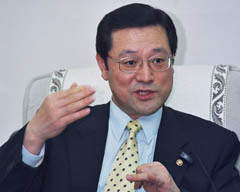 The mission of tax administration reform was to make a "Trustworthy National Tax Service" through much reduced red-tapes for fair and transparent taxation and efficient tax administration, as was put by Commissioner Yong-Sup Lee who took the rein of the nation's highest tax administration in March, 2003. In the same vein this year based on the strong review of the Tax Administration Reform Committee, NTS announced on June 10 "2004 Tax Audit Policy Directions" which are aimed at reducing time and administrative red tapes for all sorts of taxpayers. NTS says that the directions of this year are most reformative and comprehensive in the history NTS tax audit administration. The directions include the candidate selection criteria for tax audits and the outline of the NTS' audit management based on the analysis of the tax returns attributed to tax year 2002. These directions will be applied until the next year's directions are published. Following are the specific directions newly outlined in this year's announcement. The basic purpose of a tax audit is to establish a voluntary self-assessment system by spreading the idea that compliant return filing from the beginning is in one's favor rather than being audited intensively. Therefore, the basic policy of tax audit management hereafter will be focused on making a tax climate to encourage voluntary tax compliance as well as collecting evaded taxes from each taxpayer. NTS will operate tax audits fairly and transparently in accordance with tax laws and principles. Tax audit policies are equally applied to both domestic and foreign companies without discrimination. 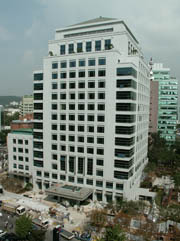 NTS has been striving to create a better investment environment for foreigners. For this, NTS is actively catering the needs of foreign companies, and managing tax audits fairly and transparently to reduce the audit burdens on honest foreign companies. Tax audit candidates this year are those taxpayers who demonstrated low compliance based on the result of taxpayer compliance assessment which is conducted through the computer-based assessment system, and whose tax returns have not been audited for a considerable period of time. This selection will be determined objectively and scientifically based on the NTS computer system. The ratio of taxpayers to be audited will be reduced to the minimum necessary to encourage tax compliance, reducing NTS' intervention in taxpayers' daily business activities. NTS will, however, heighten audit intensity on those selected for tax audit and thoroughly collect the evaded taxes. In principle, a tax audit focusing only on the transfer pricing issue will not be conducted unless there is a clear indication of tax evasion or the period for the tax authority to assess taxes is almost expired by the statute of limitations. Instead, a transfer-pricing audit will be incorporated into the course of routine corporate-tax audits. The number of business years subject to an audit on transfer pricing issues will be shortened from five to three reducing audit burdens on taxpayers in providing requested documents. Before a tax assessment by a district or regional tax office on transfer-pricing audit is finalized, the headquarters of the NTS will review its validity in advance to preclude unreasonable tax assessment and enhance consistency among taxpayers. Expansion of "In-Tax-Office Audit: " To ease the audit burdens, NTS will apply the "In-Tax-Office Audit" to foreign companies that are estimated as relatively honest by conducting the audit in the tax office rather than the company's office. 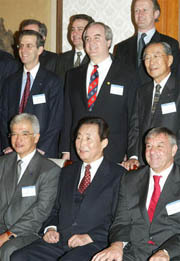 Mr. Koh Geun (second from left, seated), the former prime minister, poses with CEOs of foreign corporations in an recent investment meeting in the Prime Minister's Office. Minimizing the period for field audits: If a tax audit is not settled only in the issues on international transactions, NTS will increase the application of "Step-by-step Audit Closing System." If a taxpayer under audit has no indication of tax evasion, NTS will withdraw the auditors from the taxpayer's office and the audit will be closed before the audit period is terminated. The companies, which have been audited in the recent two years, will be exempted from tax audits unless there is a clear indication of tax evasion, to reduce the inconveniences arising from frequent audits. Minimizing the amount of documents to be submitted, and allowing sufficient time to submit offshore documents. NTS will try to minimize the amount of documents to be submitted by conducting a preliminary audit thoroughly. Foreign companies will be given sufficient time to submit offshore documents requested for the audit. In case the result of a tax audit reveals relatively high level of compliance, the concerned taxpayer will be designated as an "Exemplary Taxpayer" and will be rewarded with various benefits such as exemption of tax audit for three years. Protecting the Taxpayers' Rights through the "Tax Audit Service Center"
Dedicated duty officers are assigned in the "Tax Audit Service Center" to deal with tax problems of foreign taxpayers during a tax audit in a fair and transparent manner. Main tax issues arising in tax audits will be discussed at the "Tax Disputes Committee "to raise consistency and adequacy of tax assessments on cross-border transactions. the "Tax Administration Real Name System"
NTS has initiated the "Tax Administration Real Name System" for the prevention of false assessments and the protection of taxpayers' rights. Under this system, all tax administration processes such as assessments, appeals and collections are accumulatively computerized in the name of the officer in charge of each process, and the officer is regularly evaluated through this system. Introduction of the "Prompt Review System"
NTS will relieve compliant taxpayers from their uneasiness by resolving ambiguity promptly and spot tax evaders at an early stage by monitoring tax returns through the "Prompt Review System" so that an audit will take place not too long after the filing of returns. With the set up of this system, an audit on a taxpayer would be conducted within two years from the date the return is filed, which is currently three to five years.